You've made a plan and intend to cover a large number of counties but it's going to be a tight schedule requiring a minimum number of missed turns. 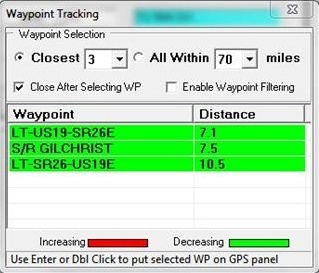 There are two features that assist in keeping on track -- one is the Multi-Waypoint Tracker and the other is an interface that will allow the driver to see important route information on an Android tablet or smartphone over a wireless connection. Waypoints are typically defined to include points where there is a change in highway. These can be identified using a mapping program like Streets and Trips. During the route planning phase a pushpin is placed at each waypoint with a descriptive label such as LT-US19-SR26E (left turn from US19 to State 26E) and these waypoints can be exported from Streets and Trips and imported into CQ/X. 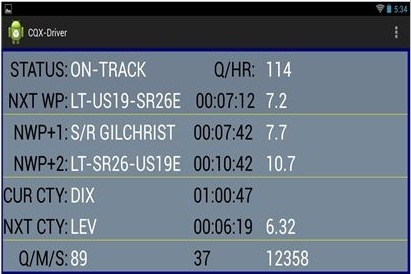 Then the Multi-Waypoint Tracker can be used to provide a display similar to the one on the left below for use by the CQ/X operator. Here the operator has chosen to show the three closest waypoints. The distance to each will be updated on each cycle of the GPS data. As indicated on the display the operator can also elect to show all waypoints that are within a user-specified distance from the current point.